Is The Simpsons a show for kids or adults? I’ve certainly enjoyed it as both. Fox seemingly saw it as the former – the network originally wanted each episode split into three discrete stories, the way something like Spongebob Squarepants does, because it didn’t believe a cartoon could carry a half-hour plot. On the other hand, you’ve got the way The Simpsons is actually written and directed, packed with references to old films, jokes that I’m only getting now and what a TV ratings board would refer to as ‘adult situations’. The cop-out answer is, of course, to say ‘it’s for both’ and that is technically true – but these don’t feel like a Dreamworks movie elbowing the parents in the ribs with a dirty joke to make sure they’re still awake. Maybe it’s not an important question, ultimately – especially here in 2019, where shows like Adventure Time and Stephen Universe regularly cross this divide – but I find it interesting because, whichever group The Simpsons is ‘for’, it’s a show about both kids and adults. Sometimes simultaneously, sometimes not. And when it switches between the two, does it switch audiences as well? Looking at the definitive episode rankings that, as a nominal grown-up, I have been constructing as the rewatch progresses, it certainly appears so. Eight of my ten favourite episodes before this season have all centred around Homer (2.2, “Simpson and Delilah”), Marge (2.9, “Itchy & Scratchy & Marge”) or, the very sweetest plum, both together (2.12, “The Way We Was”). But this is where that all changes. 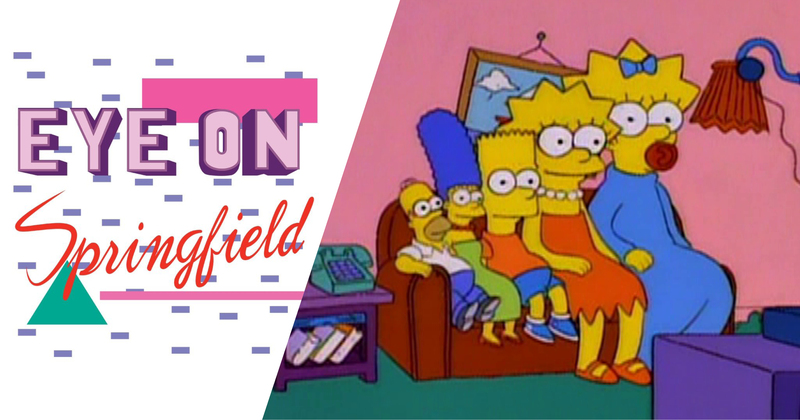 Although the consensus narrative says that The Simpsons spent it first half-decade growing up, and shifting focus away from Bart and towards Homer, the kids of Springfield have never been treated better than they are in Season 6. In terms of sheer number of episodes – for the first time since Season 1, the balance tips in the favour of the kids: twelve episodes starring Bart or Lisa, nine about the parents, and four ensemble stories – but in quality, too. Part of that might be down to the arrival of Mike Scully, who we’ll later see become showrunner. But what matters right now is that he’s the one Simpsons writer with kids of his own, and his three contributions to this season are focused on the younger generation of Simpsons: “Lisa’s Rival” (6.2), “Lisa on Ice” (6.8) and “Two Dozen and One Greyhounds” (6.20). And they’re all great. It feels like the show has finally found the comedy sweet spot for characters like Ralph, whose characterisation to this point has been all over the map but is now settled on ‘sweet idiot’. Or Martin, who is more effete here than he’s ever been before and thus more relatable to a fellow prancer like me. Or Milhouse. Oh, my dear sweet boy. 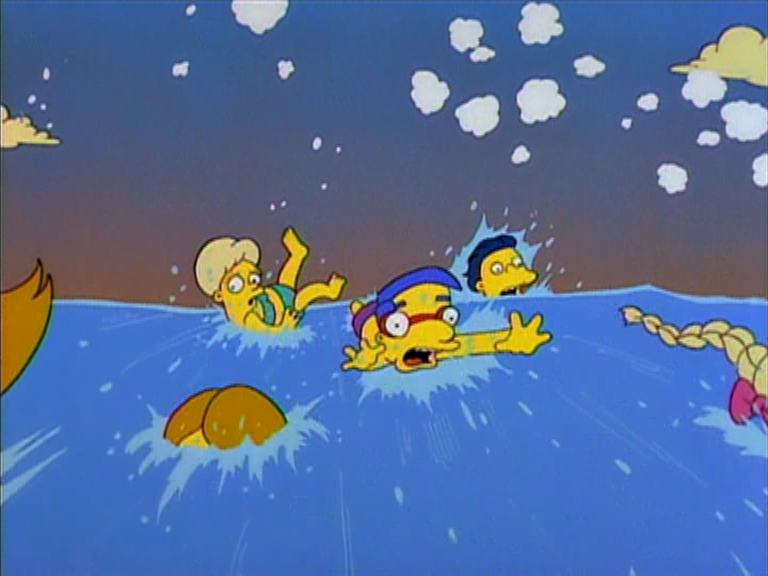 Milhouse’s role in Season 6 is basically a miniature Hans Moleman – meaning something terrible happens to him at a rate of about once per episode. Let’s list just a few of them: plastered in bumper stickers and pushed down a hill (6.5), captured in a net and dragged alongside a horse (6.7), smashed in the face with a hockey puck, hard enough to knock out his teeth and give him a concussion (6.8), eaten by Lumpy, the school snake (6.22), held at gunpoint by an FBI agent, forcing him to jump over a waterfall (6.2), pulverised in a giant blender (6.6). If you judge MVP status entirely by ‘number of times he should have died’, Milhouse is the clear frontrunner for Season 6. Bodily harm aside, though, there’s one kid character who benefits from this season more than any other. It’s time to talk about my complicated relationship with Lisa Simpson. If you’d asked me ahead of this rewatch who my least favourite member of the Simpson family was, I’d have said Lisa. Yes, I’d have put her below Maggie, just out of sheer spite. Part of this can probably be put down to context. 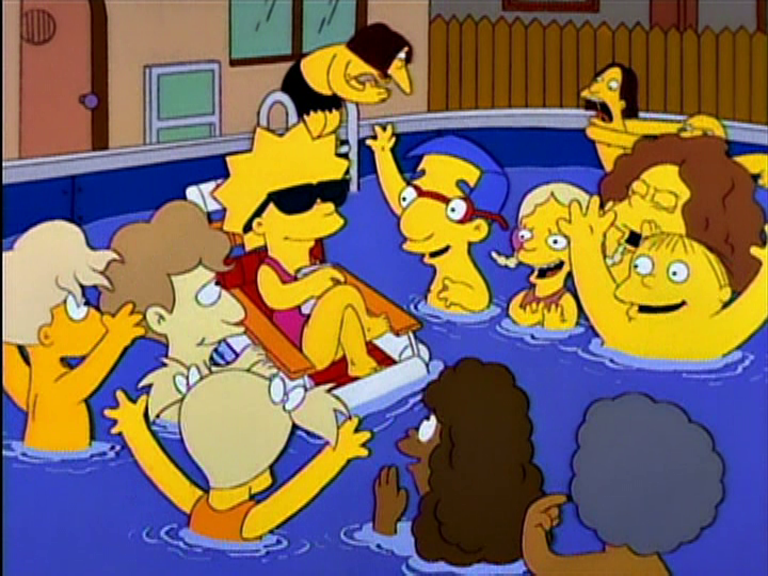 The first time I fell in love with The Simpsons, I was young enough that Lisa probably got dismissed with an ‘ew, girls’. My little sister was – and remains – a pain, why would I root for another one on telly? And let’s not be too kind to our problematic author: this was a time where the causes Lisa most prominently stood for, vegetarianism and feminism, were simply not my causes. But even in the warm-up to writing Eye on Springfield, listening to Simpsons podcasts, I got tired of how quick most fans were to compare themselves to Lisa – the good one, the smart one, the righteous one. It just seemed like self-flattery. Of course, to quote a show that I suspect a modern-day Lisa would approve of, the situation’s a lot more nuanced than that. Lisa’s characterisation has varied hugely up to this point. She’s at her least interesting when she’s written as just the Good Kid (she gets good grades and isn’t like Bart!) or a generic Little Girl (she must like dolls and ponies!) – characterising her as a sister or a daughter rather than an individual. 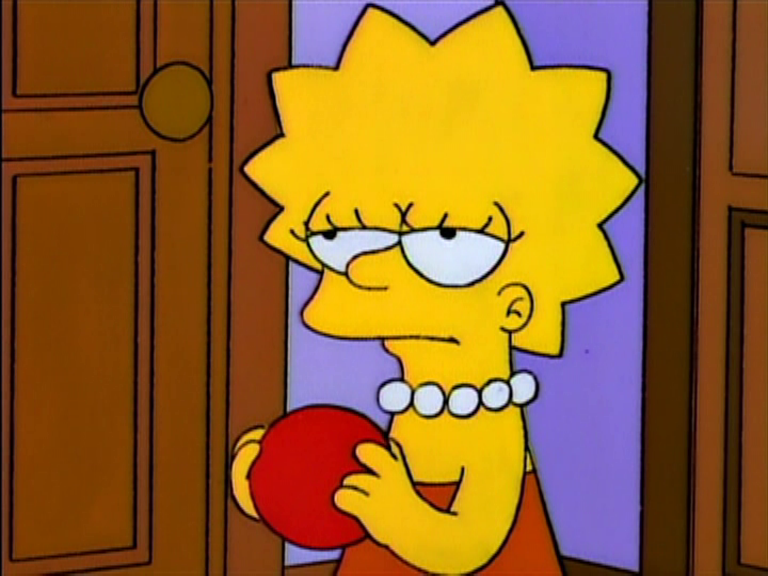 The Simpsons is a show about screw-ups, and this version of Lisa doesn’t really fit into that. You get a single complicating factor, which is basically her default joke: putting polysyllabic wisdom in the mouth of a young, innocent-seeming girl. That puts her in the role of foil, voice of reason or just plain assistant to her (mostly male) co-stars. There are plenty of good episodes where Lisa is the family’s – and show’s – moral centre, but I like her best with some rough edges, and Season 6 is great at that. “Lisa’s Rival” is all about how insecure Lisa feels when faced with someone as smart, or maybe smarter than her. “Lisa on Ice” highlights her sibling rivalry with Bart, and how nasty it can get when they’re being pitted against one another. “Bart in Darkness” shows her throwing away all her principles for a brief taste of popularity. When school is cancelled in “The PTA Disbands!” (6.21), Lisa desperately misses it – not so much the actual educational value but because it provides the validation she doesn’t get at home. Her ‘Strike Preparedness Kit’ is a tape recording of Miss Hoover saying “No talking. Is that gum?” over and over. As the strike continues, she begs Marge: “Grade me… look at me… evaluate and rank me! Oh, I’m good, good, good, and oh so smart! Grade me!” Lisa is presented as an addict, who can be placated with a meaningless ‘A’ scribbled on a piece of paper. Lisa might often be lonely at school, but she needs its structure. A structure that constantly reinforces that she is the best. This Lisa, one who can’t stand being anything other than the absolute best at something and, as we’ll see in later seasons, will give up on something if it provides an actual challenge? Who will happily compete in anything – sports or exams or life as a whole – as long as she can win at it? Who is just desperate to be validated? Yeah, that might be a character I can see myself in. 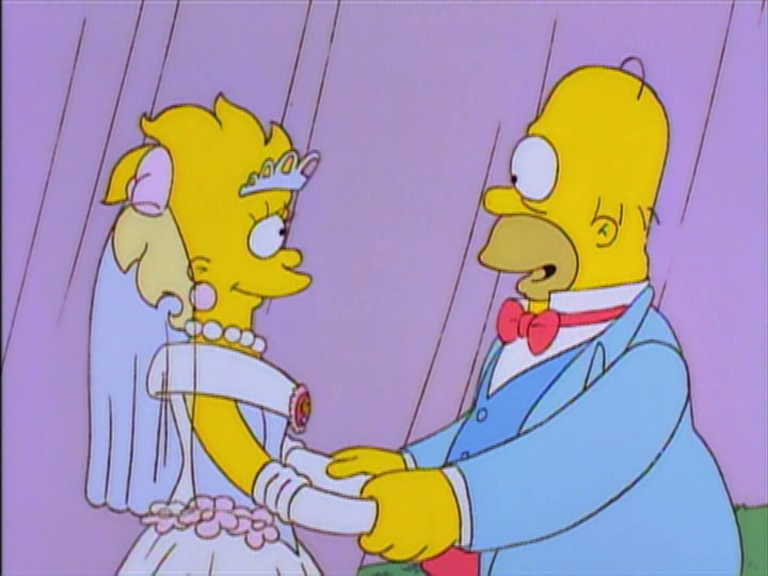 Lisa also gets handed this season’s masterpiece, the third episode of the show to win an Emmy, and my second favourite of any I’ve watched so far: “Lisa’s Wedding” (6.19). In my long-held distaste for Lisa, I’d managed to forget – or ignore – just how great this episode is, and how important to the show as a whole. It invents a whole new type of Simpsons episode: the flashforward, a brief respite from the constant unmoving status quo that can introduce new ideas. In the case of “Lisa’s Wedding”, we see the first references to Lisa’s vegetarianism, a season before she quits the meat in the present day. We get the running joke of never being allowed to hear Maggie’s voice, even when she’s an adult. The Lisa/Milhouse romance makes its first real appearance, providing yet another kick in the crotch for our poor blue-haired nerd. By jumping ahead fifteen years, to the far-flung future of 2010, it’s able to take a common thread of Lisa-driven stories – how she sees her place in the family – and gives it a fresh twist, because she’s old enough to flee Springfield. She’s ashamed to introduce the Simpsons to her new boyfriend, who comes from a very different background, but she won’t sell them out. The episode climaxes in an all-out assault on the heartstrings, a beautiful scene between Homer and Lisa. 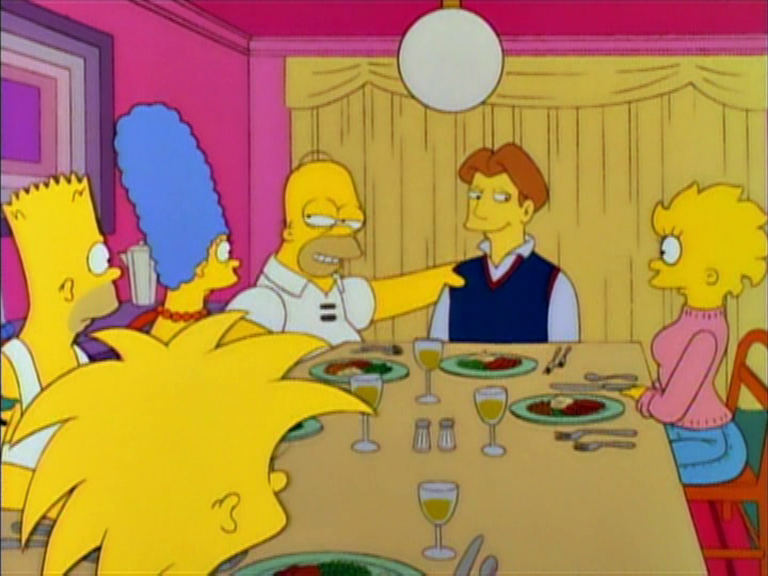 Because of the future setting, Homer is able to show some permanent growth, that he learned something from every episode that paired the two. It’s a perfect cap to all those daddy/daughter stories, the majority of which hadn’t even been written yet. Ultimately, Lisa accepts her place among these screw-ups. And she fits neatly in, because the season has worked to show that, in her own specific set of ways, she’s a screw-up too. In a glimpse of the future, we see the story of Lisa’s first true love. The Springfield film festival brings The Critic‘s Jay Sherman to town, as Barney’ film faces off against Mr Burns’. Santa’s Little Helper has a litter of puppies. They’re adopted by Mr Burns, whose intents are more than a little Cruella de Vil. A feud between Skinner and Krabappel ends in a teachers’ strike at Springfield Elementary. A fierce hockey rivalry pits Lisa and Bart against one another. If you enjoyed this piece, and want to support the site, visit patreon.com/timplusalex to help us make more stuff.